Week 4 of being a Georgia O’Keeffe intern and I am still being surprised daily. We as interns are offered so many opportunities we would not have otherwise. From meeting talented local artists to working in Georgia’s Abiquiu garden this experience has been nothing short of amazing. 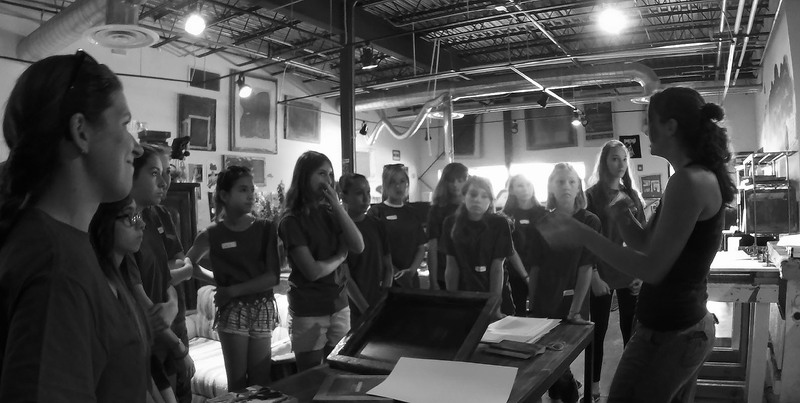 This week we got the opportunity to visit Warehouse 21, which is a center for the arts, primarily serving the Santa Fe youth. It is a place where they can come expand their artistic horizons and hone their existing abilities. Warehouse 21 offers a variety of programs and on this visit we were lucky enough to try our hand at screen printing. The Arts and Leadership girls and interns were greeted by Nathalie Nunez, a talented designer and expert screen printer, to familiarize us with the screen printing equipment and explain to us the process. Here is a quick over view of our experience screen printing on fabric. To create a screen print we first selected the screen with the design we wanted to print. From there we selected a squidgy, the device used to push the ink though the screen, that is the appropriate size for the image on the screen selected. Then it’s time to choose an ink color, which proved to be the hardest part for me. There are so many to choose from! Next we laid the item we were are printing on down on a flat surface and position the screen. It helps to have a printing buddy hold the screen down by applying pressure to the edges so it doesn’t move while you are printing. Next we spread the desired ink across one side of the image on the screen, I was a pusher so I made a line of ink at the bottom. Then simply pull or push the ink across the image on the screen! We learned if the screen didn’t make a zip type sound when you drag the squidgy across the ink was not pushed all the way through and you might have to do a few more passes to ensure a clean print! It took me a few tries to get the hang of it but, the girls seemed to pick it up right away. We were having so much fun creating one of a kind designs by layering different screens on top of one another. Printing on paper, fabric scraps, shirts, canvas bags, the options were unlimited. I didn’t want to stop! Our group could have kept printing all day and still left wanting more. This was an awesome experience and my favorite of the summer thus far. I cannot wait to go back to Warehouse 21, gain more experience, and make some more treasures.